Anyone can become a Referral Partner of Sideline Prep, as long as they are passionate about our services and believe in our Mission. 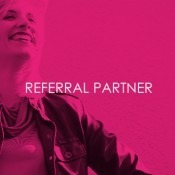 All Referral Partners must use ethical marketing methods to promote our programs and services. It’s super simple! Just enter your contact information below to get all the details on how to sign up as a Referral Partner. Then go at it! Tell your friends about Sideline Prep and our services.